LOS ANGELES, CALIFORNIA, USA, January 21, 2019 /EINPresswire.com/ -- Starting a new business that serves millions of people around the globe is a difficult task at any age, however, at the age of 17, it sounds almost impossible. There are some exceptions to this, youngsters who are full of ideas & energy are creating a new world & setting new rules. Millionaire by 21 & retirement by 25 is the new life goal. One such example is Noah Ruehli, a 17-year-old boy living in Switzerland, originally from South Africa who has created a mobile app platform called Synbook1 that will connect people in their real life by connecting each other over a map. The 'Synbook' smartphone app is available on both Android & iPhone. Noah conceived & refined the concept so that people can get directly in touch with people who are interested to meet each other. The demand & application of such a platform is limitless. The app has been designed & developed with rigorous research & development process over one year. It is focussed on the younger generation that devotes a lot of time on social networking apps. The entire experience of finding & connecting with people in real life just for friends or for business with the skills you are looking for is transitioned from a boring liking site to a social networking app with Synbook. Noah had the realization that people interacting on social networking sites can do a lot more than just liking & commenting on each other's pictures. He has a vision of the world where person's will be able to connect with each other anywhere in the world and people will meet each other again in real life. Synbook aims to transform the social networking experience from a distraction productive engagement for the users. Other team members involved in the project were 'Evan Luthra' and 'Bastian Yotta'. Evan took care of the technical aspects of development as CTO & Bastian consulted about the marketing strategy. Noah was prominently overseeing the entire design & development process as he has acquired a lot of knowledge about IT development through self-learning & interacting with tech-entrepreneurs. He did not have a formal school education & was faced with debt issues during childhood. In his opinion, the problems he faced during childhood brought him the determination to succeed in life & he started working since the age of 12. Over the last 5 years, Noah has gotten rid of his debt, started many entrepreneurial ventures & created multiple jobs. He wants to provide youngsters with better opportunities to realize their dreams & get guidance from others with experience through Synbook. Synbook headquarters are located in Zurich Switzerland. 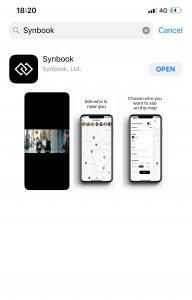 The team behind Synbook is confident of the success of the project & Noah is leading the marketing & advertising campaigns to introduce the app to the world. The vision of Synbook is to use technology to create a transformative change in our society by mutual cooperation & talent recognition. At the moment the app is only available in Switzerland. It will be available international in a few weeks.